A money saving combo pack! 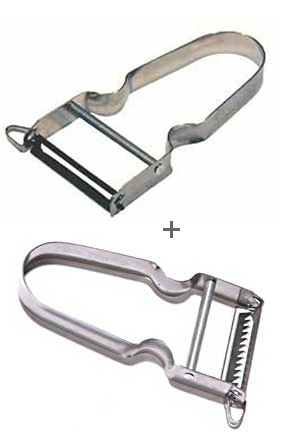 Order both of these Star Peelers together and save! Get the Julienne Peeler and the regular Star Peeler together and and pay a lower price. Both of these peelers can be purchased separately, but we offer this combo, so that people wanting both can pay a lower price. The regular Star Peeler will outperform virtually any other vegetable peeler on the market thanks to it's advanced design and super sharp blade. The julienne peeler is the perfect addition to any kitchen, and will allow you to create perfect, professional looking strips from your favorite fruits and vegetables. With these two products in a drawer in your kitchen, you will be prepared for any peeling task. Order Your Peeler Combo Today! Star Vegetable Peeler by Zena - Eat healthier and show off your cooking talents with this easy-to-use kitchen gadget. It is sharper and easier to use than any other vegetable peeler on the market. Great for left handed people or those with arthritis. Order Yours Today. Star Julienne Peeler by Zena - Eat healthier and show off your cooking talents with this easy-to-use kitchen gadget. It is sharper and easier to use than any other julienne peeler on the market. Great for left handed people or those with arthritis. Order Yours Today. Product as I have seen in you tube video demos .perfect and good. Thank and I hope you will be more prompt in delivery system. I have had the regular star peeler (and very happily) a long time, but it was lost in the chicken coop and the compost pile, and although the blade still works(!) in its current state, a new one is even better. I did not previously live and work with Julienne, but she is a sweet gal. The things she can do to a carrot, a zucchini, a cucumber! (I said to not with). She is way better than her distant cousin Juliet. All SHE did was pine away and die over a few days' fatuation with some boy. Teen Drama. But Julienne is a hard and willing worker. You will love how quick and easy it is to get little tasty bits without dragging out the heavy appliances. Great - using them all the time. Would recommend highly. Thabks for the timly shipping of my Star Peelers. The blade is realy sharpe and cuts through vegs like melted butter. I would recommend this peeler. Yes, thank you. As I ordered 7 of these Star peeler combo sets and will give them as Christmas gifts to family and friends, I haven't tried them. But I know from using these peelers before that they are "First Class", that's why I trust the quality and ordered so many. Thank you for shipping them. Received the peeler about three weeks ago. I have used it a few times since. I tried to peal a brown onion with much success. I am delighted with its performance. I would buy another one if I thought it were necessary. These are very sharp and very ready to use. I bought a set at a festival locally. I found them online to buy for family. The peeler easily peels cucumbers for my salad. The other one cuts zucchini into strips for zucchini spaghetti. I had never eaten zucchini spaghetti before, but it is great. I highly recommend these peelers to you. The two pair I bought here were shipped to family members. Shipping was fast. I really love my star peelers. I have some arthritis in my hands and peeling any food with a knife is not easy. The star peelers are easy to handle and do a very good job. I'm glad to find a source for them.